Production has ended at a china clay pit as part of cutbacks by Cornwall's biggest employer, Imerys. More than 200 china clay workers clocked into work at the firm's Blackpool pit for the last time. A total of 500 people are being made redundant as Imerys prepares to move some of its business to Brazil. The company says it is trying to help workers find new work and has set up a drop-in centre to assist in the search for employment. The French-owned company employs 2,000 people but says the cuts were necessary and would help ensure the future of the rest of its operations in the South West. It is closing one of its seven china clay pits in the St Austell area, a refinery and two drying units. Unions claim the planned cuts will take £12m a year out of the local economy. A company spokesman said the number of compulsory redundancies was a "floating figure" that was changed weekly, as some staff sought alternative employment. 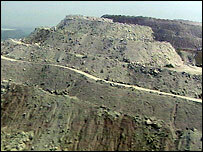 The company is the world's largest producer of china clay, operating in 250 locations in 43 countries. The china clay industry in Cornwall was started 260 years ago by English China Clays, which was taken over by Imerys in 1999 for £756m.